You’ve seen these types of cars driving around everywhere – the low-riding cruisers, the lit-up rides and all the rest – but the real question is whether or not you know where they came from. Or, when they came from. OK, probably not, as these types of things are fairly obscure and wonky. But they’re also fascinating. So, next time you’re at the stoplight next to one of these bad boys (if that’s how you’d like to describe them), roll down your window and give the driver a bit of a history lesson. In theory, They’s (cue: screeching chalkboard noise in the background) creation is awesome. Think about it — it’s like starring in some racing game with cool cars. But in practice, it tends to be somewhat distracting in traffic. Then again, Ferraris are really dirstacting in traffic and I don’t complain about those, so maybe I’ll just end that train of thought right there. Red, white, blue and blinking ground effects are typically illegal since people might think you’re a cop, and Michigan outlaws under-glow lighting completely (you do your thing, Michigan!). Laws on underbody lighting vary between states and regions, so it’s always best to call local authorities and check. And with that in mind, it might be best to turn them off completely for road trips. As a self-employed inventor, They is also credited with the invention of sunglasses with a visor topping each lens. So, he creates lighting effects first, and then provides eye protection for the public with some sunglasses to wear... at night (ba-dum-tss). He’s a pretty stand-up guy in my book. Note: Not quite sure if those sunglasses are actually meant for nighttime use, but for narrative purposes, we’ll go with it. Or “pokes.” Or “elbows.” Honestly, I could probably take up the few paragraphs I planned for the history of these by just listing all of the nicknames they have. These weapons on wheels (dramatization) are typically a foreign concept to those outside of Texas – at least, in my experience talking about them – and are most popular in Houston, as described by this Houston Chronicle article (which is generally just garbage, as writing goes, but definitely shows that swangers are a Real Thing). Toned-down versions of wire wheels existed decades earlier than the 1980s, but the company that brought the style back in today’s market, Texan Wire Wheels, cites the ones produced for Cadillacs in ‘83 and ’84 as its inspiration. (And before that, the idea probably came from ancient scythed chariots — who wants to think about that while driving, anyway?). The Cadillac wheels stopped production after two years, but Texan Wire Wheels brought the product back years later and allowed elbow enthusiasts to deck out their rides once again. Swangers typically adorn cars known as “Slabs” — debated as an acronym for Slow, Low and Bangin’ or Slow, Loud and Bangin’. As a frequenter of the Texas roads, my advice is to do your best to make a wide path around wheels that look like they’re ready to slice anything that comes near. Let’s just hope they don’t take after Pinocchio’s nose and start to grow outward. If there’s anything we can say about the spiked-wheel community, its members must have some serious skills — especially in drowsy transit that naturally comes with early mornings or late nights on the road. Can you just imagine misjudging a parking spot and whacking one of those into a curb? Lowrider cars have a deep history of acting not only as a cultural staple, but also as a platform for social activism. 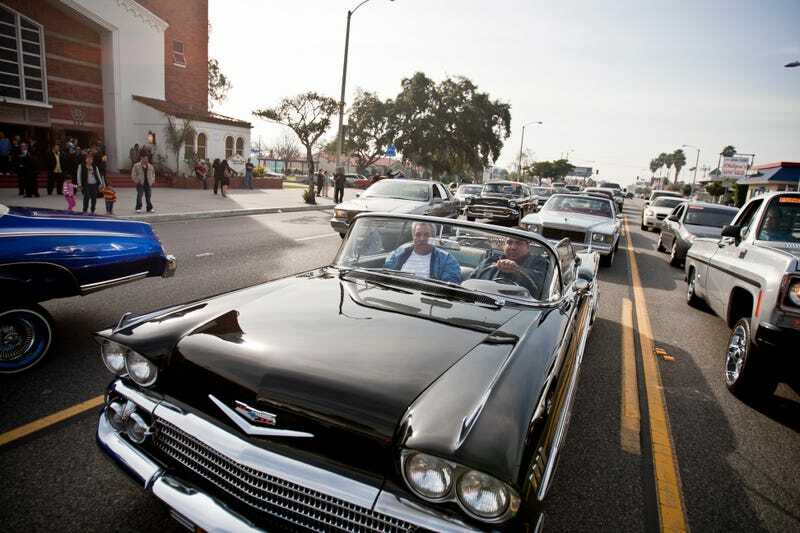 Cars in East Los Angeles started dropping it low after World War II and car clubs began forming in the 1950s, but the customized style didn’t really catch on at a commercialized level until Lowrider Magazine began circulation in 1977. The magazine, and the lowriding car culture in general, assisted in the Chicano rights movement in Mexican-American culture. Early issues of Lowrider covered not only the motorized aspects of the cultural push, but also social inequalities like police misconduct, prisoner rights and media representation of Mexican-Americans. Today, there are laws regulating how low the cars can go (obviously, you can’t drive through the streets plowing your car against the concrete), so it’s best to stay above the “scrub line” if you want to remain street legal. All in all, social movements and cars are two of the things that help make this world pretty great. When combined? Boom, confetti. Now, I could’ve ended this post with a number of trends – jacked-up trucks, steer horns mounted on cars, color-changing headlights, blacked-out vehicles or anything else – but the origin of bumper stickers is particularly fun (and quirky), so bear with me. Bumper stickers can be traced back to the 1940s, when the owner of a print shop decided to change the game on the roads: rather than attaching actual signs to cars with wire or string (all I can imagine right now is a “Just Married” sign with some rusted, empty cans trailing behind a car), Forest Gill decided that he could come up with a better way for folks to advertise their interests and (sometimes) their unsolicited political views on the bumpers of cars. With that in mind, Gill marched out to a Kansas City, Kansas parking lot and measured the bumper of a car. He went back into his shop and began producing stickers with fluorescent paint and self-adhesive paper, later testing to see if they’d fit on a car’s bumper. Methods changed as time went on, developing adhesives that left less of a residue and using other materials such as vinyl to survive the weather longer. Surprisingly, the first uses of bumper stickers were travel souvenirs and the like – political ones didn’t come onto the market until the 1952 presidential election. When you think about it, though, all existing forms of bumper adhesives (including the chrome ones and the rest of that fancy stuff) stemmed from one guy deciding to plaster some sticky paper on a car. If he hadn’t, my chrome Texas Longhorns decal might be dragging from the back of my car like a “Just Married” sign.